Water Crisis in India: Is There Water in the Well? In this brief Earth and Sky radio short, the topic is India and the severe drop in groundwater tables. As researcher from Columbia Casey Brown states, the primary reason for the decrease in groundwater supplies is the widespread use of water for agricultural purposes. 90% of India’s water supplies to be exact. Above Photo: Waiting for drinking water in India. Rupert Taylor-Price on flickr. The UN Food and Agriculture Organization maintains AQUASTAT, an extensive online database for global agriculture and water information. 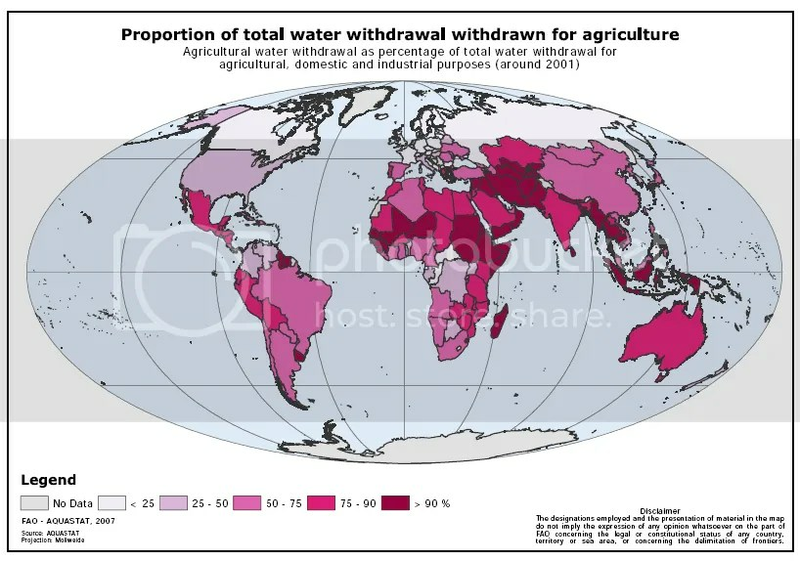 The FAO map below shows the extent of water withdrawn for agricultural uses (over 2/3 of global water supplies). The FAO map also provides detailed country specific information, see an overview of India’s agricultural economy here. India has the second largest irrigated area in the world, but due to the rapid expansion of irrigation with its emphasis on new construction, irrigation performance and the sector’s increasing management needs have not received adequate attention. The development impact of irrigation has been well below its potential, and deficiencies in implementation have accumulated over time. The above-quote indicates, at that time, India’s agriculture was well below potential. However, groundwater pumping has become popular over the last two decades in India. With groundwater tables dropping as they are, this does not seem a dependable resource to sustain current agricultural activities. Try to save even a single drop of Rain. Unless conditions will be horrible.